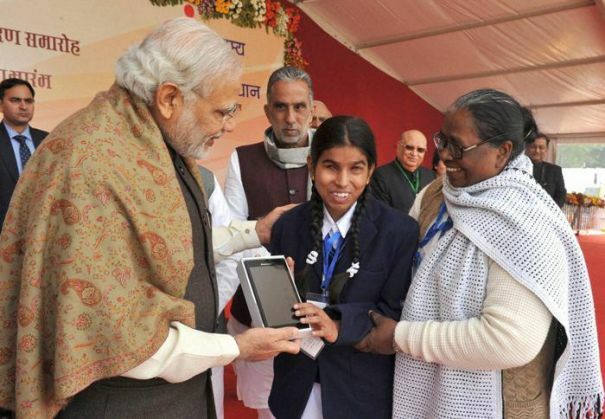 Prime Minister Narendra Modi, who visited his constituency Varanasi on Friday, distributed assistive aids to more than 8,000 differently-abled people. During the session, PM Modi also interacted with children who have received help with speech and hearing problems under the ADIP (Assistance to Disabled Persons) scheme of the Central government. In the event, which is said to be one of the largest of its kind, more than 25,000 aids such as wheelchairs, hand-driven tricycles, smart crutches, and hearing implants, were distributed amongst 8,000+ beneficiaries. The Union Ministry for Social Justice and Empowerment has reportedly written to the Guinness Book of World Records to take note of the event. In his recent radio address, the Prime Minister made a plea to Indians to use the word 'divyang' (born with a divine limb/organ) instead of the term 'vikalang' (handicapped) while addressing the differently abled. He said that this will help in increasing sensitivity in the society and help the differently abled to live a more dignified life. There have also been reports that a new Disabilities Act may be passed by his government wherein the word 'handicapped' will be replaced with 'impairment', in all national institutes, as a mark of 'changing attitudes' towards persons with disabilities. During Modi's last Varanasi tour, on December 12, he witnessed the famous Ganga Aarti on the banks of the holy river, accompanied by Japanese Prime Minister Shinzo Abe.